Gamers love good sound. Gamers need good sound. To get the most out of your gaming experience, you will need a headphone set that allows you to hear the enemy before the enemy hears you. The Logitech G430 7.1 DTS Gaming Headset offers the level of comfort and life-like sound that even the most discerning pc gamers will appreciate. At a price tag for less than $50 on Amazon, you will search long and hard for a reason not to try them out. The absurd notion of a dedicated PC gamer sitting alone in their parent’s basement for hours and hours, playing mindless videos games on a dusty game console and forgoing any human interaction for a few golden coins is not only insulting, but it simply isn’t true. That scenario is nothing more than a lazy, late night, talk show joke. The reality of contemporary pc gaming is very different. With the advancement of online gaming, MOAB games, eSports, and gaming tournaments, PC gaming has transformed into a shared experience with a positive outcome dependent upon effective teamwork and communication. Gaming has grown into a very popular spectator sport as made evident by the success of ESPN’s Rift Rival competitions featuring celebrity gamers such as Tyler “ninja” Blevins and All “Myth” Kabbani. As gaming laptops have evolved, it is easier for gamers to schedule meet-ups at local comic book stores or on college campuses, making gaming a much more social activity compared to years past. In fact, a Pew Research Report reveals that PC gaming play an important role in the creation of a teens’ friendship. More than half of teens have made new friends online, and a third of them (36%) say they met their new friend (or friends) while playing video games. Among boys who have made friends online, 57% have done so by playing video games online. Nearly a quarter (23%) of teens report that they would give a new friend their gaming handle as contact information. Technology plays a huge part in this social activity. Picture and sound work hand in hand bringing the designer’s vision to life. 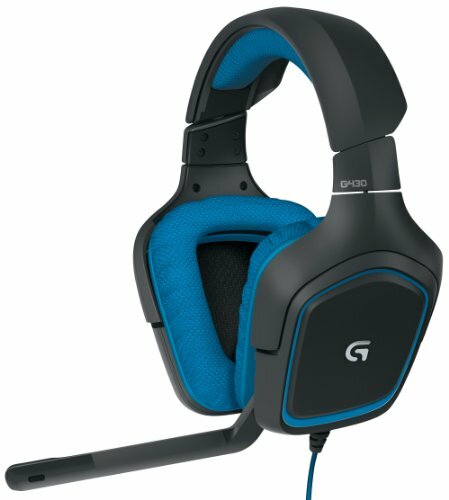 Here, we will spotlight the many reasons why the Logitech G430 Headphones will be an asset to you and your team. Second only to picture, sound is the most important aspect of an totally immersive, reliably accurate, and most victorious experience — whether you are playing online, on a console, or in a group setting. Choosing the right headset makes all the difference. Take into consideration which platform you play on and the types of games you play. Most gamers don’t play for 10 or 15 minutes. Gaming sessions can reach up to several hours. Most gamers don’t play for 10 or 15 minutes. You need a headset that won’t drive you crazy after 30 minutes of play. You want a headset that doesn’t intrude on your concentration. A great headset will to add to the experience, not take away from it. 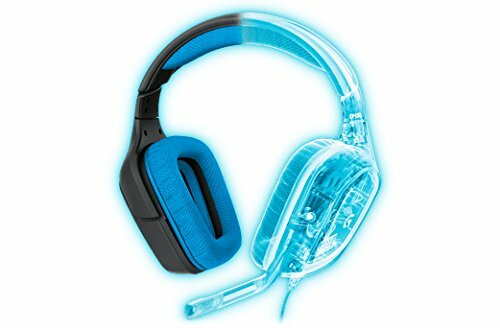 If you play for many hours at a time, you need to pick a headset that is non-intrusive and very comfortable. You must clearly communicate with other players in the game. That means you need a headset with a hands-free, built-in microphone with noise cancellation. That will guarantee that when you talk to your fellow players, you will be clearly understood. When choosing a set of gaming headphones, you want to make sure the product is well made. You want a product that will last. Looking great is one thing, but if the headphones start falling apart after a few long gaming sessions, what’s the point? Make sure that top quality materials are used in any headphones you purchase. Superior sound is a "must have" when it comes to choosing the right gaming headset. Competitive gaming requires you to trust the sounds you hear. Being able to pick up on environmental sounds is absolutely essential to team victory. Your chances of survival in a game depends on instant reactions to specific sound queues. To ensure your best efforts and that you consistently have the competitive edge, you need headphones that deliver accurate sound. The Logitech G430 features on-cable controls, so you can easily adjust the volume or mute as needed. Audio controls are located on the 2.3-meter cable. The best gaming experience comes from the feeling that you are immersed in the world the designers have created. The Logitech Dolby 7.1 and DTS Headphones let you hear your game the way the developers intended. You don’t want to be distracted by an annoying, ill-fitting pair of headphones. The G430 multi-positional ear cups pivot for a secure, personalized fit. They can rotate 90 degrees and lay flat, if you like. The lay-flat design makes them much more accommodating for travel, and much more comfy when resting on your neck. Comfort is key when gaming for long hours. Uncomfortable headphones can be a real distraction from your best gaming skills. The G430 ear pads are lined with a unique, sports-performance cloth that is soft to the touch and very comfy. We really like that fact that you can remove the cloth cover to wash. The G430 ear cups are slimmer and lighter than others on the market, yet the audio quality remains top notch. When the rubber meets the road in gaming, you need to be able to speak with your team clearly. Background noise can interfere with your ability to communicate. The Logitech G430B Mic adjusts so that just your voice comes through. It’s good to get a sense of what people who own and use the product have to say about the performance and durability. The following are reviews that real Amazon customers have left regarding the Logitech G430. 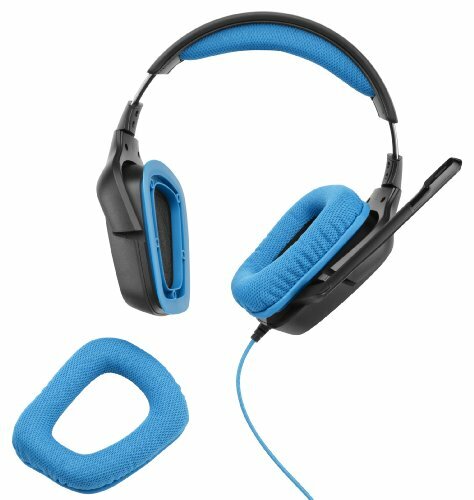 I bought these to replace a high end Astro headset with an external amplifier. After it broke due to poor quality, and being out $200 for my trouble, I needed something that would work for long-term use. 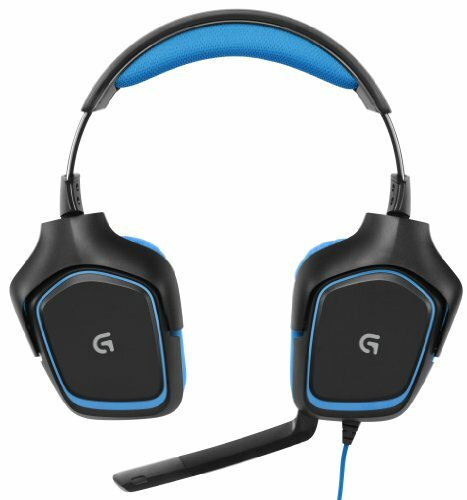 Some looking around, and the [Logitech G430 7.1 DTS] kept coming up in people's recommendations. I pulled the trigger without reading all the way, expecting a bog standard, cheapo headset with the bog standard 3.5mm jack, something I'd probably use as a stopgap until finding something a bit more substantial. Comfy, great sound, with a USB sound card! All for $40! My expectations were exceeded in just about every way possible! Let's talk about comfort. The headset is light, without feeling cheap, which is a huge bonus for something being worn for hours at a time. There's enough padding on the headband that I don't have to worry about the plastic digging into my scalp. The ear-cups are just big enough, and despite having some misgivings when I first bought them, and got my hands on them (the fabric feels "crinkly" in the hand), hours later, there's no fatigue. A pleasant surprise. Sound quality is utterly equivalent, at least to my ears, with my previous Astro set which was connected over optical. In other words, excellent. Highly, highly recommended! I love, love, love this headset!!! Comfortable, crystal clear mic, 7.1 surround sound, nice build quality and it looks darned nice too! If you are concerned with durability, my experience after 6 months of almost daily use is that I have not had a single issue. No cracks, breaks, tears, failures or diminished sound quality. It looks, functions and sounds like brand new to this day. Considering the overall quality and functionality of this headset, at this price point, it's a no-brainer. Buy it, you won't be disappointed. For the money, you can't get a better set of PC headphones. Mind you, they're not $200 SteelSeries, but they're 80% of that — at 30% the cost. We now have three pairs (everyone in the family), and have had zero problems with them. For Stereo sound, these are full sounding and reasonably clear. There's a little mud, but if you're used to headphones in the low-mid range (up to $100), these will match up very, very well. The artificial surround is surprisingly good in Guild Wars 2, with good directional field despite a little more mud in the sound overall — some would call the mud "fullness." In FPS gaming, the surround leaves a bit more to be desired. In TeamSpeak or Mumble the microphone is quite clear, much better than most of our teammates. If you're not into push-to-talk, the thresholds are pretty easy to configure, plus there's a mute switch on the volume controller that is usually within easy reach if you can spare the hand. The included USB sound card is a good add, well-aligned to the capabilities of the headset. This is easily the most comfortable headset I've ever used. I have difficulty with my ears hitting the speaker in many headsets, and I don't like a lot of weight on the top of my head. These headphones solve both problems. The clamping force is enough to keep the headset in place while using the top pad only to keep alignment; and the depth of the speaker cups ensures my ears don't contact the plastic around the speaker. There have been some complaints about the pivot joint where the earpiece meets the headband. I can see this being a weak point, but after a few years, we've not seen one break yet. All in all, an exceptional value. Until I'm willing to invest in a set of high-end full-surround headphones, these are my go-to. 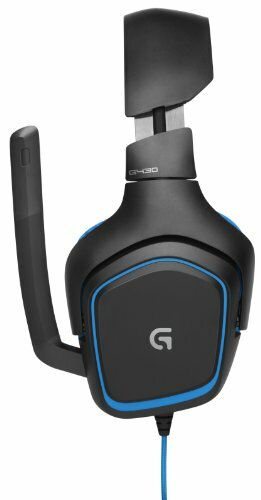 It is easy to recommend this product after considering the sound quality, style, design and functionality of the Logitech G430 Headset. When you combine those features with a price tag of under $50, the Logitech G430 is a super product for any gamer. However, not everyone is satisfied with the Logitech G430 gaming headphones. We think it is beneficial to point out what some of the “less impressed” purchasers have observed. Some users have complained that, even after a firmware upgrade, their mic performance was less than what they expected. Others have had experiences where the ear cups come apart, and the controller wire shorts out over time. However, even the detractors are quite impressed with the sound quality and accuracy, as well as the overall comfort. Their expressed concerns are mostly related to the durability of the product. The Logitech G43O brings with it impressive surround sound and comfort for long gaming sessions. The noise cancellation microphone is a must-have. The product looks good and is well made. You will enjoy an immersive, 360-degree sound field, allowing you hear what you cannot see. Very impressive lightweight design. The soft, sport cloth ear cups are made for comfort, and the useful 90-degree swivel contribute to a personalized fit. Reduces background noise for clear voice pick up. Mic rotates up and out of the way for convenience. Volume dial and mute switch for audio adjustments. Works with PS4 and Windows 10, Windows 8, Windows 7 or Windows Vista computers. We really like this product. Even though some users have been less than impressed, the overall impression from gamers is that the Logitech G430 delivers on all things that matter: comfort, superior sound and price.